Sun City Center, America’s premier “55-and-better” Master-Planned Community is still growing and blossoming with new homes and new businesses. As more and more Baby Boomers retire early and more Snowbirds sell their homes up north, our population is increasing exponentially. With the arrival of the Amazon distribution center just across the Interstate, this area is poised to have a huge growth spurt over the next three to five years, making southern Hillsborough County one of the premier places to do business. Add to that the construction of the new science building at Hillsborough Community College and you have a workforce ready to perform in industries ranging from biotechnology to medicine to earth sciences. 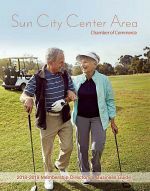 Once known as a great retirement community with beautiful golf courses, Sun City Center and the surrounding area is quickly building a reputation as THE next place you want to be for business. The benefits of Chamber membership are numerous. Some benefits will be more important to you than others. The main benefits though are universal. Chamber membership conveys credibility and stability to your customers. Being a member of the Chamber of Commerce will open the door to many contacts that can help your business grow through the power of referrals and networking.